After your bonus hour, that's it from tonight's Europa League. Arsenal manager Arsene Wenger speaking to BT Sport: "We had a slow start and there was an accidental goal. After that it was important not to concede and panic and put more pace into our game. From then. we controlled the game and won convincingly in the end. "I think Sanchez is still running after his best form. He is a fantastic football player but physically he has just come back. But he has it in his locker to do something special, which he did. "We want to do well in all the best competitions and I had an experienced team today, even though I made nine changes. They are all top class players, there is no hierarchy in the squad." Arsenal’s Hector Bellerin speaking to BT Sport: “It’s a new competition for us so we had to set the tone. We think we are one of the best teams in the competition so we have to show that on the pitch. “I’m very happy for the victory. We were ready to play at eight o’clock, but these things happen. We started a bit with cold feet but after that it just worked. Sead Kolasinac’s goal was the 200th scored at home in European competition under Arsene Wenger – totals now stand at 125 goals at the Emirates, 69 goals at Highbury & 8 goals at Wembley. Arsene Wenger has now beaten 57 different clubs during his tenure as Arsenal manager (from 64 different teams faced). In the other game in Arsenal's group tonight, Red Star Belgrade drew 1-1 with BATE Borisov, meaning that the Gunners are two points clear at the top after one game. So victory for Arsenal, but the game seems almost irrelevant after the unsavoury pre match trouble. Uefa will investigate and numerous questions need to be answered, most significantly how did the segregation break down so alarmingly with thousands of Cologne fans in Arsenal areas, including the family section? 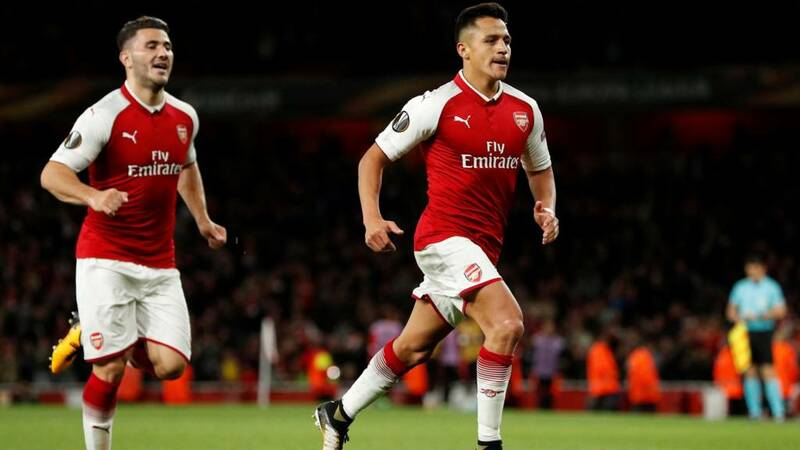 It was a good win for Arsenal in the end with two terrific goals from Sead Kolosinac and Alexis Sanchez, but it's a night that won't be remembered for the football. A far from routine on and off the pitch - but a strong second-half showing gives Arsenal a good win in the end. Champagne stuff from Arsenal now as they put together a flowing, trademark move of one-touch passing and movement.There are backheels from Jack Wilshere and Olivier Giroud, Reiss Nelson is involved as Alexis Sanchez eventually floats a chip across goal and wide. That Hector Bellerin goal was the cue for many fans to leave the Emirates. We are already an hour after schedule of course. Youngster Reiss Nelson comes on for Arsenal in place of Theo Walcott. It has been a very good second half for the hosts. That does seal it now! Sead Kolasinac does well again to drive down the left and put in a low cross, Jack Wilshere sells a lovely dummy on the edge of the area which takes two defenders out of the game. The ball ends up at the feet of Theo Walcott, his shot is saved by Timo Horn but Hector Bellerin, backing up behind, reacts well to sweep home. The game's not yet won as we reach the final 10 minutes. Cologne sub Milos Jojic rattles a shot straight at David Ospina. Chance to seal it for Arsenal as Jack Wilshere plays a neat pass into the run of Alexis Sanchez - he lifts a shot wide but the flag was raised anyway. Arsenal have been much better since the break. Alexis Sanchez hits a free-kick straight at Timo Horn in the Cologne goal. It's been a lonely shift up front at times for Jhon Cordoba but the former Mainz man does brilliantly to run from halfway and force David Ospina into a decent save low at his near post. Theo Walcott is offside again. He has made that run in behind so many times tonight. Jack Wilshere is on for Alex Iwobi. His first appearance for the Gunners in 13 months. Another beauty! Alexis Sanchez is running away from goal but still scores! He is actually handed a poor through ball which forces him very wide to the left, he cuts back inside, into the area, and then is forced out of the area. He is running back towards his own goal and then somehow hooks his foot around the ball to curl in deliciously into the far corner. Superbly done. His first of the season.